Please call 318-586-4721 for more information. Tournament will be held at San Miguel Park. Stay tuned as details are announced on the website. 2 Corner Lots-Plus one adjoining! 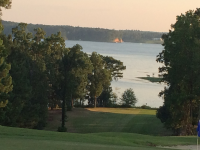 Sign up for our email newsletter to keep with the Toledo Bend Lake community. We promise no spam and a simple opt-out whenever you like. 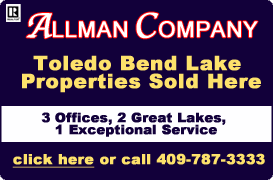 Visit our Toledo Bend Lake Sponsors! Water stained; 62–66 degrees; 1.60’ low. Black bass are good on green pumpkin soft plastics, crankbaits, and Rat–L–Traps. Striped bass are fair on silver spoons. White bass are fair on minnows and white Li’l Fishies. Crappie are fair on minnows and red tube jigs. Bream are good on worms. Channel and blue catfish are fair on frozen shrimp and stinkbait. Yellow catfish are slow.